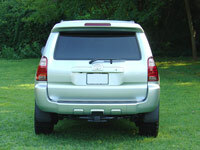 Look at any 4th generation 4Runner and you will notice right away the wheels are set too far inside the fender flares, especially on the 2006-2009 models that had larger flares as part of the mid generation refreshening. 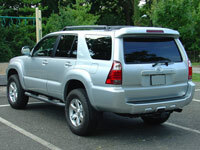 This is quite noticable especially when comparing my 2007 4Runner to my 1999 4Runner with the slimmer black highlander flares. 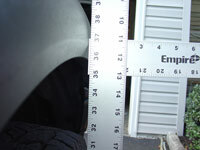 The tires on my 1999 are actually outside the fender flares by 1/4", giving a wide agressive stance. Even though my 4th generation 2007 4R has been lifted and reshod with new and upsized A/T rubber, it just didn't have that perfect stance with the wheels inset so much. 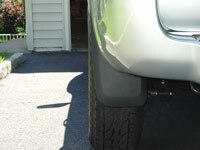 Wheel spacers could correct this by pushing the wheels outward more. 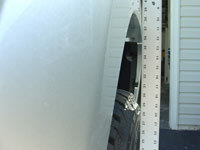 The additional tread/trac width (62.0" factory width, 64.50" trac width with spacers) would be a side benefit as well, offsetting the lift's additional vertical height and providing more stable handling. 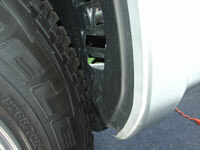 You can see the Front tire (left) is inset by 1.25" and the Rear tire (right) by 1.75"
Here you can see that the tires are outside the flares by about 1/4"
The Toyota 4Runner's factory wheels, as most other recently manufactured factory wheels, are hub-centric. A hub-centric wheel uses a chamfered center bore that fits onto a corresponding raised section of the hub, centering the wheel perfectly. 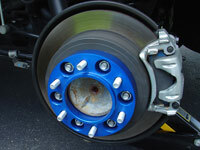 When the lug nuts are tightened, the weight of the vehicle is supported solely by the fit between the wheel's center bore and the hub. The wheel bolts or studs then serve simply to hold the wheel onto the hub, and are loaded only in tension, where they are most strong. If the studs were required to absorb vertical forces, they would be loaded in single shear which is the weakest arrangement for a fastener. 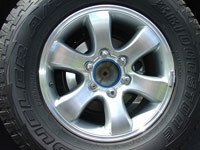 Alternatively with a lug-centric (non hub centric design), the wheels are located and centered by the taper of the lug nuts or bolts and support the entire weight of the vehicle. Taking that information into account, when choosing a wheel spacer, a hub-centric design was my first and most sought after charateristic. Using a hub centric wheel spacer ensures that your factory wheels positively engage with the spacer, and that it in turn positively engages with the hub on the vehicle, centering them perfectly to avoid vibration problems. 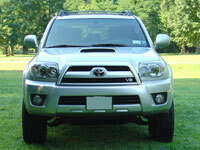 Unfortunately, there are not many brands of wheel spacer that are hub centric and made for the Toyota 4Runner. In fact other I was only able to find one, Spidertrax. 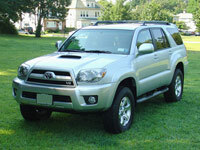 Other competing wheel spacers manufactured for the Toyota 4Runner are not hub centric, resulting in a set-up that has the potential for vibration, balancing, and other problems. 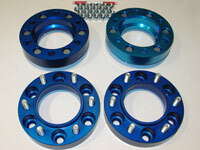 Spidertrax offers a Hub Centric Toyota Wheel Spacer Kit, Part# WHS-007. They fit various Toyota Hub Centric Axles with a 6 on 5-1/2" bolt pattern and they are 1-1/4" Thick. 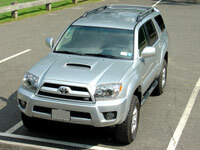 Being that they are made to fit various Toyota vehicles such as the 4Runner, FJ Cruiser, Taco and Tundra they are somewhat of a compromise. Why do i say that, well the Spidertrax spacers are offered for the 4R application, in only one thickness (1.25") and one color (Anodized Blue). While the hub centric design is a must and the primary and foremost consideration, being able to choose the exact thickness and color would be perfection. 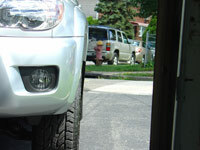 Sizewise, a 1/2" thicker spacer out back would make the tires sit precisely flush on a 2006-2009 4R with the larger flares. I believe the 1.25" spacers are perfect for the 2003-2005 4R. 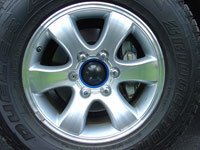 As far as the color is concerned, sure these are mounted behind the wheel, but the purist will note that they can be seen through the aluminum factory wheel spokes and if blue is not your thing, then take it or leave it. These are very minor details that would not, and have not, made me second guess the purchase. 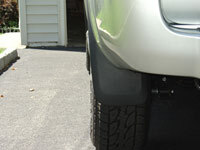 The 1.25" spacing makes a very dramatic difference that is well worth the cost. These Spidertrax 1.25" thick, 6 on 5.5" 6061T6 aluminum spacers are an easy way of spacing out front and rear late model Toyota axles that run hub centric wheels (wheels using shank style lug nuts). 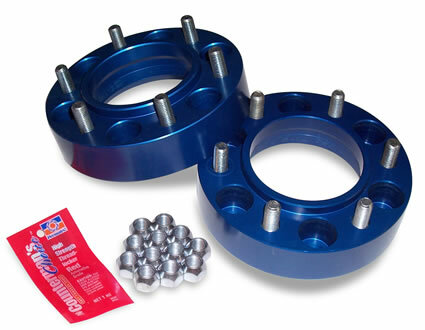 Each kit comes with 2 wheel spacers, 12 metric M12x1.5 wheel studs (pre-installed), 12 M12x1.5 lugnuts, and Loctite. 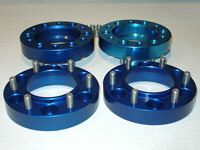 The wheel spacers are anodized in dark blue, which is a double anodizing process for twice the corrosion resistance. 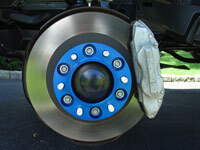 In addition, each wheel spacer is both wheel & hub centric for a perfect OEM fit. They are manufactured in the United States of America in Longmont, Colorado. 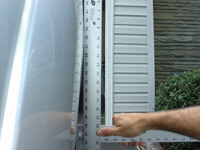 Installation is simple and straightforward and can be done with one person working alone. Perform the complete install on one corner at a time. 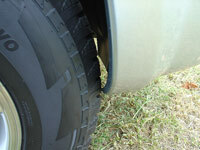 Loosen the lug nuts on the wheel before jacking the vehicle up. 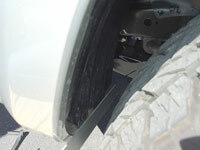 Then jack up and place a jack stand under the vehicle at the proper location. 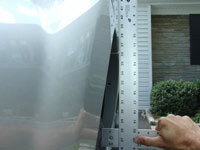 Release the weight of the vehicle from the jack and onto the stand. Remove the 6 lug nuts and take off the wheel. I took the opportunity to wax the wheels at this time, including the lug nuts. 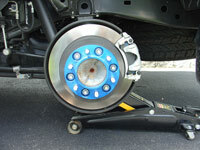 With the wheels removed from the vehicle it is much easier to wax all the way into the lug nut area. 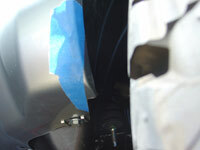 Clean the hub area with a wire brush if needed to ensure the spacer will seat flush. 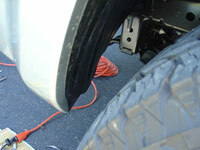 Using the included red thread sealant (loctite), coat each of the 6 factory wheel studs. Place the wheel spacer over the studs and hand tighten the included Spidertrax lug nuts, facing the tapered end towards the spacer. A torque wrench is highly recommended and what I like to do is to first torque down the lug nuts, in a star pattern of course, first to 40ft. lbs., then to 60ft. lbs., then up to the final 83 ft. lb. value. 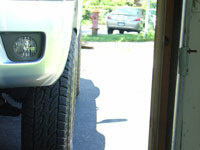 Tip for the front installation: Before starting, lock the center differential and put the 4WD selector in 4Lo. 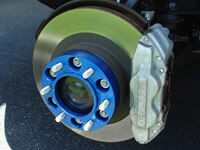 This keeps the wheels from spinning while tightening the lug nuts. I am not sure why this prevents the wheel from turning as the 4Runner's front differential is still "open", but it works. 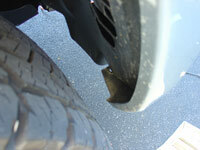 Tip for the rear installation: Before starting, engage the parking brake. This keeps the wheels from spinning while tightening the lug nuts. 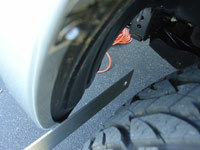 Although not an issue for me, many people install spacers to gain extra clearance between the upper control arm and the tires. 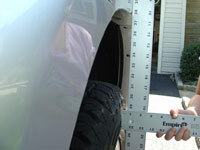 This can be the case when installing 285mm width tires or installing wider or different offset wheels. 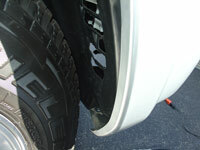 Again I had no tire rubbing before installing the wheel spacers. 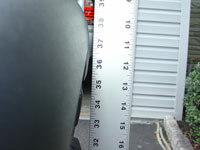 But after the installation was complete and I headed out for a test drive, I immediatly noticed tire rub on the inside front plastic wheel liners when turning the wheel at near full crank, or when encountering inclines/declines while moderatly turning the steering wheel. I anticipated this would be the case before the install and knew the fix was an easy one. 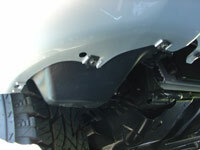 Looking underneath the vehicle where the front bumper meets the fender flare, you will find 2 10mm screws on the driver side and 3 on the passenger side. 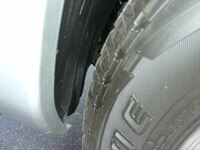 With the steering wheel turned so the wheel is turned fully into the well you will clearly see where the rubbing occurs. The tire was pressed right against the plastic liner. Remove the 10mm screws mentioned above, remove the plastic nutsert, push the liner forward as much as possible, and drill a new hole in the liner. You can discard the nutsert you removed, install a larger washer (I used a homemade rubber washer) and reinstall the screws. 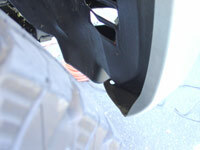 Moving the plastic inner wheel well liner forward a few inches alievated tire rubbing there. 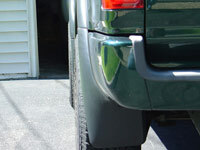 But now I noticed that while backing up small inclines with the steering wheel turned moderately I have tire rub on the lower bumper corners at the point they curve into the wheel well. 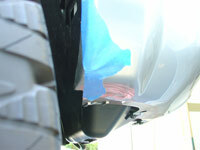 Using blue painters tape, mask off the area to be trimmed. This will provide a straight line to follow while cutting. I made the first cut using a cutoff wheel on a dremel tool and followed this up with a sanding drum for final finishing. The cut comes out quite nice and clean and you really cannot even tell that trimming was done. 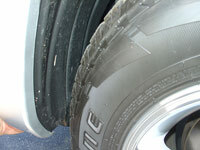 There is room left to do more trimming if necessary, such as going to an even larger tire size.